Today I should have been out celebrating and enjoying myself, quaffing some local wine and no doubt stuffing myself with traditional foods, whilst listening to Canarian musicians and learning more about “my” island. However, I wasn’t, instead I am lying on my couch, amusing myself by writing this to distract myself from the constant urge to empty the contents my stomach. All is not perfect, you see, in paradise. I seem to have food poisoning. In lieu of joining the celebrations I thought I might do one of those boring posts which really belongs in a tour operator’s webpage, but which will relieve both my boredom and my self pity by reminding me how much I enjoy being here. 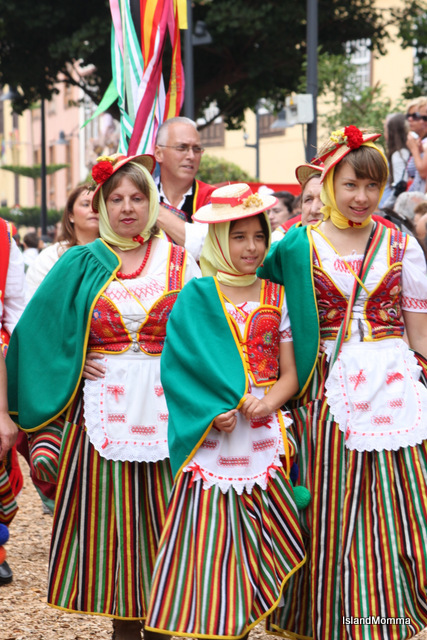 Traditional Tenerife: You would be surprised at just how many folk possess and wear with pride their traditional dress. There is said to be a different variation for every municipality on the island. The first parliament of the autonomous region, Canary Islands, sat on May 30th 1983, after a long wait. The creation of autonomous regions had first been undertaken by the government of the Second Republic in 1931, but by the time the Civil War broke out in 1936 nothing had been implemented in the political bickerings which preceded the Civil War – and of course everything then went on hold during the war and the consequent iron grip which Franco had on the country. With his death in 1976 many of the reforms and projects which had been abandoned or iced began to resurface, and the new (and current) Constitution, drawn up in 1978, provided for the establishment of autonomous regions and some decentralization of government, and so the Autonomous Parliament of the Canary Islands was born. May 30th was declared a fiesta (bank holiday) in celebration of its birth, and the day is marked throughout the islands with displays of traditional crafts, sports, costumes, foods and music. 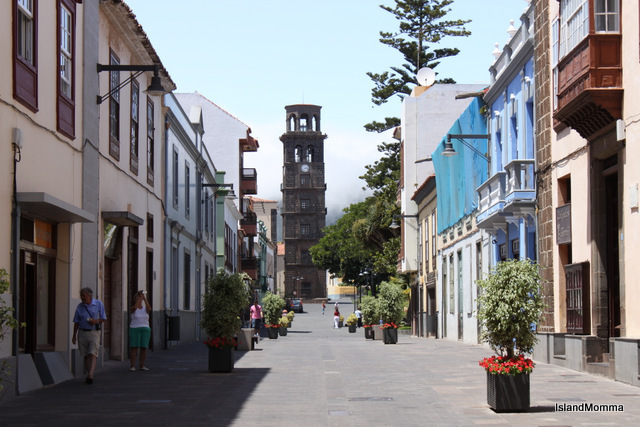 Historical Tenerife: The original capital of the island, La Laguna. An UNESCO World Heritage Site and seat of the province’s university, it is both charming restoration and vibrant hub of the island’s creativity. Tenerife, for anyone who is new to my blog, is just one of the seven main islands which make up the Canarian archipelago. It’s been my home base now for over 20 years. It has an image in some European circles of being merely a mass-tourist destination, but it is so much more, and if you need proof then just check some previous posts. Since I can’t give you a first-hand report on the festivities to which I didn’t go, I offer you, in honor of this day, a photo essay of this island of Tenerife, showing its different faces, its variety and perhaps an understanding of why it fascinates me so much. 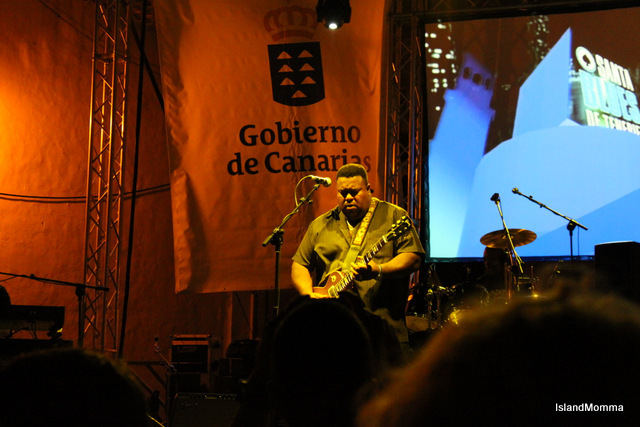 Musical Tenerife: Two things come to mind when you combine the words Tenerife and music – folk music and the salsa of Carnaval, but there is so much more for lovers of all kinds of music. This photo was taken at the annual Santa Blues Blues Fest in June. July sees a prestigious jazz festival, autumn an opera season and year round classical music lovers can listen to the Tenerife Symphony Orchestra. Coastal Tenerife: tanning addicts swarm to the resorts, but there are also plenty of quieter, more natural beaches to be found. 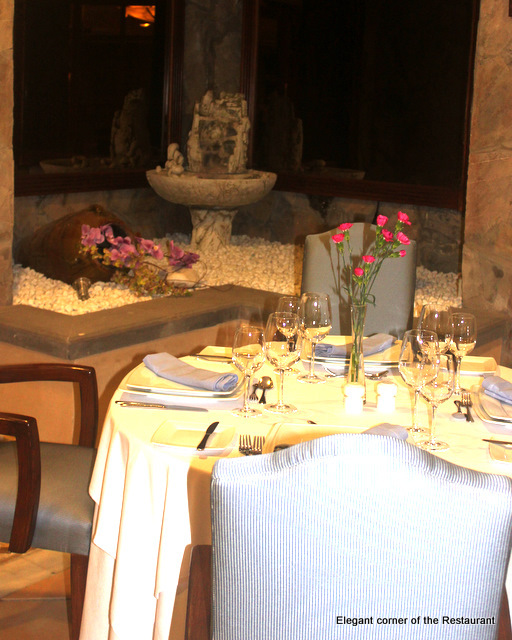 Gourmet Tenerife: In recent years the standards and aspirations of restaurants and hotels have simply soared. You can now find cuisine from almost anywhere in the world, and quality equal to big city eateries. 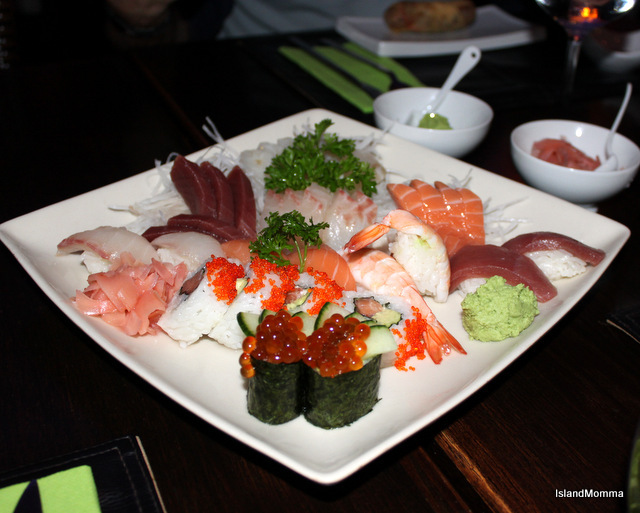 This sushi at Restaurant 88 in La Caleta, Costa Adeje. 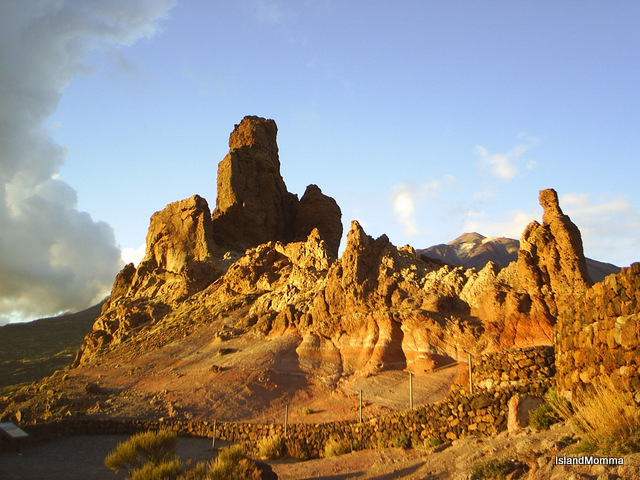 Mountainous Tenerife: The island’s mountains actually come in all shapes and sizes from lushly forested ones on the north east tip to the surreal volcanic landscapes of the Teide National Park, home to Spain’s highest mountain, El Teide. Wine Lovers’ Tenerife: Canarian wines were famous as far back as the 17th century, and were famously (for we English-speakers) mentioned by Shakespeare on more than one occasion. Tenerife boasts no less than 5 regions. 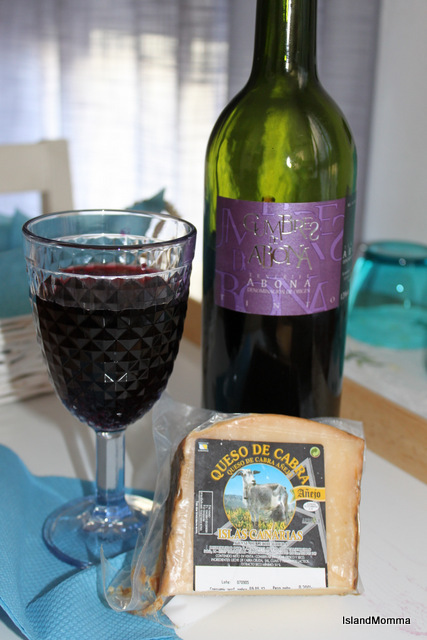 Oh, and I throw in here cheese too, because the goats’ cheeses are the perfect accompaniment! 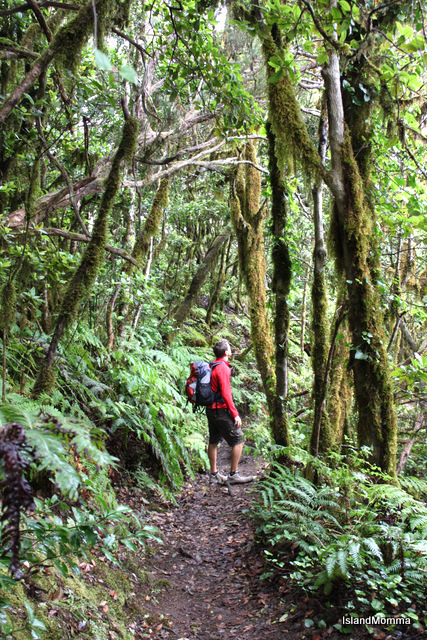 Hiking Tenerife: Volcanic badlands, lush forest, coastal trails a walker’s heaven, in other words. 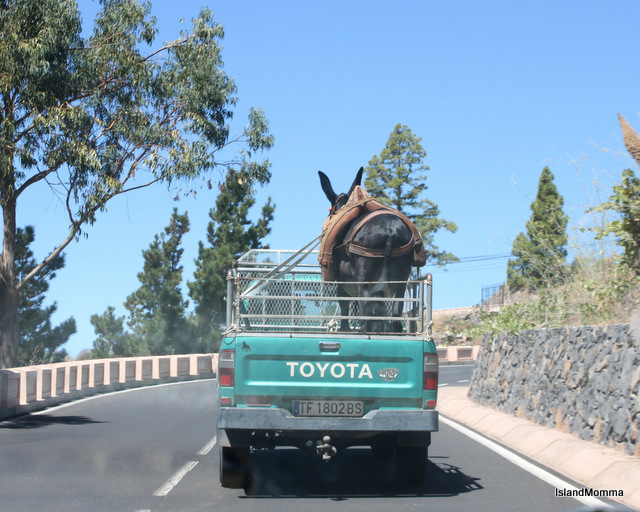 Tourist Tenerife: This is, believe it or not, the only Tenerife which some people know. I am a beach addict, but this is my least favorite face of the island, which is not to rubbish it. It’s just that sharing a beach on this scale is not my thing, but clearly it is for thousands, and the municipalities of the south, mainly Arona and Adeje cater for mass tourism, leveling rocky stony beaches, building hotels (the more recent ones of very high standard) and generally attempting to cater for every whim of the sunseekers. 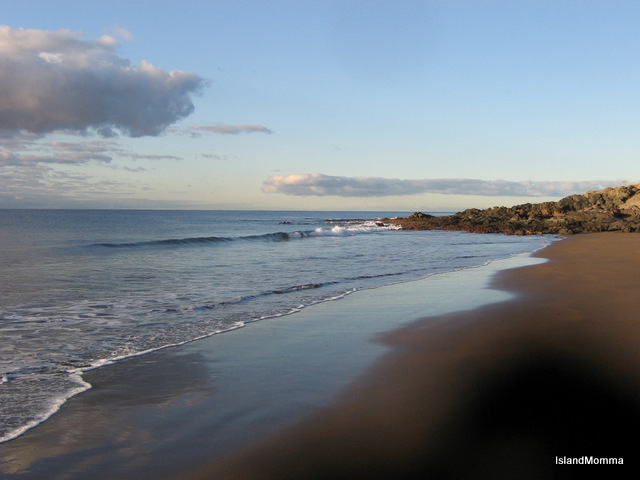 Tenerife does not have the prettiest beaches in the world, but they are some of the sunniest. Agricultural Tenerife: OK the photo is just a bit of a stretch, and may have been more appropriate under the “traditional” heading, but it’s just that I love oxen. 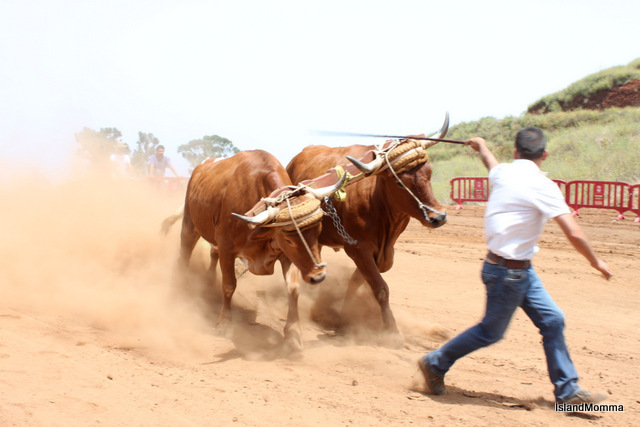 These days they are, so far as I can make out, brought out only for fiestas and other traditional events, but were an important part of the island’s history at one time. There are none of the huge farms of the US prairies or even the big farms I’ve seen in Scotland here, but thanks to co-operatives bananas, tomatoes and the famous Canarian potatoes are still exported, though not to the extent they were in history. Did you know that London’s Canary Wharf was named for the islands? So great was the volume of exports to England alone at that time. 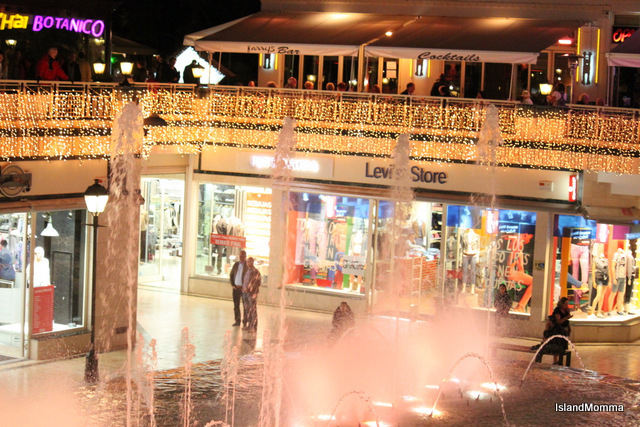 Shop-till-you-drop Tenerife: Neither the Via Veneto nor the Champs Élysées, nevertheless shop shopaholics can have a ball in the swisher parts of the southern resorts and in the island’s capital, Santa Cruz, these days. Sporty Tenerife: Surfing, windsurfing, hiking, cycling, paragliding, sport fishing, running, golf, kite surfing, climbing, trail running, triathlons, tennis…….that’s just off the top of my head, the sports which immediately come to mind. Delicious Tenerife: Fine dining apart, Tenerife has a wealth of simple and traditional dining too, with fresh ingredients sourced locally from mineral-rich farmland, the variety of the ocean and locally raised goat and pork. 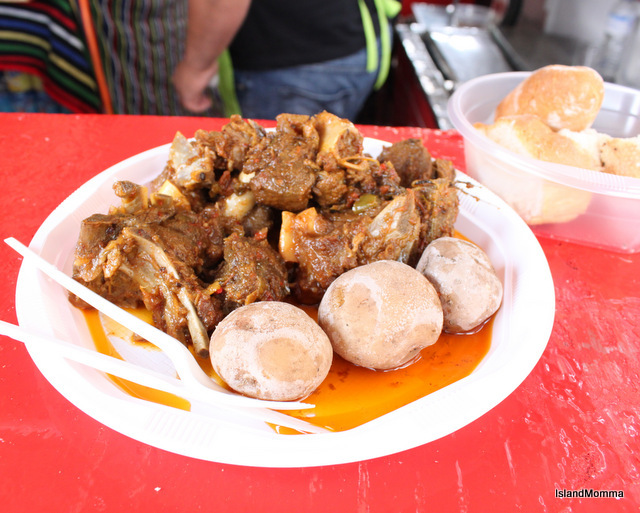 Go inland to find small bars and restaurants, or to the kiosks at the fiestas. 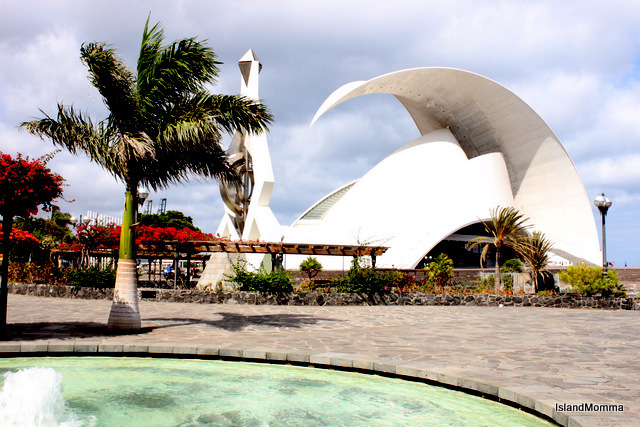 Cultural Tenerife: Santiago Calatrava’s magnificent auditorium in Santa Cruz is symbolic of the wealth of island’s Cultural (with a capital C you note) events. An icon of modern architecture it is home to the symphony orchestra and scene of ballet, opera, jazz, world music, modern dance and many other events. In addition the capital has the historic Teatro Guimerá and La Laguna is home to Teatro Leal. Then there are museums, art exhibitions, photo exhibits and other events galore. Granted, you may need to speak some Spanish for some of these, but a little can take you a long way. 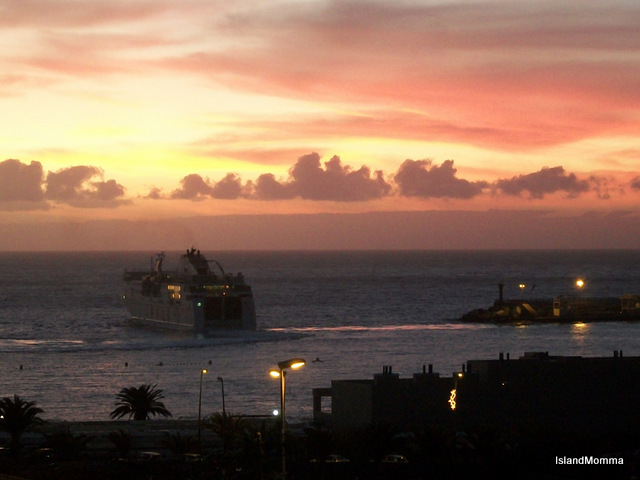 Romantic Tenerife: They tell me we have the best sunsets (and I would add sunrises) in the world. Since I haven’t been everywhere yet I can’t confirm that, but, well, they are pretty amazing. Quirky Tenerife: I suppose everywhere has its quirky side, but I would put money on it I could snap a photo every day of something out-of-the-ordinary here! Floral Tenerife: This was the hardest photo to decide, so in the end I chose two. Bouganvillea, hibiscus, geraniums, marigolds and heaps of other domesticated flora decorate the towns, villages and cities of the island, but only in the mountains will you find the tajinaste, indigenous to the island and found in the wild no where else on earth. 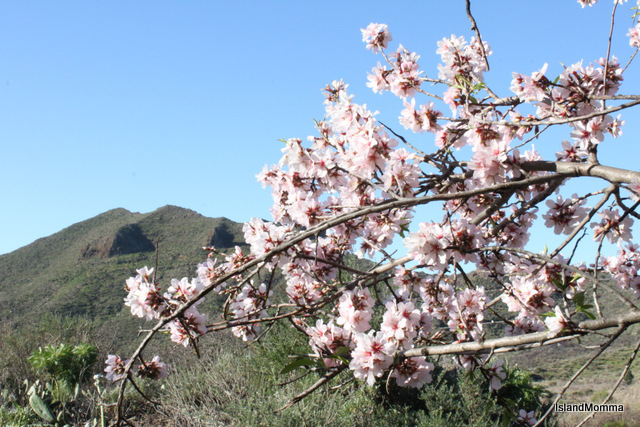 The almond trees, on the other hand, were brought by the Conquisadors, their flowering marks the beginning of a new season in January, and the nuts are the base of many artisan sweets. Travelers’ Tenerife: Finally Tenerife as gateway to the archipelago, the launching point by ferry or by local airline to the other islands in the chain. Categories: Canary Islands | Tags: agricultural tenerife, almond blossom, auditorio de santa cruz de Tenerife adán martin, beaches, canary islands, coastal tenerife, cultural tenerife, día de Canarias, delicious tenerife, fine dining, floral tenerife, gourmet tenerife, historic tenerife, Islas Canarias, la laguna, mountainous tenerife, musical tenerife, quirky tenerife, romantic tenerife, santa blues, shop-till-you-drop tenerife, sporty tenerife, sunrise, surfing, tajinaste, tenerife, tourist tenerife, traditional Canarian dress, traditional Tenerife, travelers' tenerife, volcanic landscape, wine, wine lovers' tenerife | Permalink. 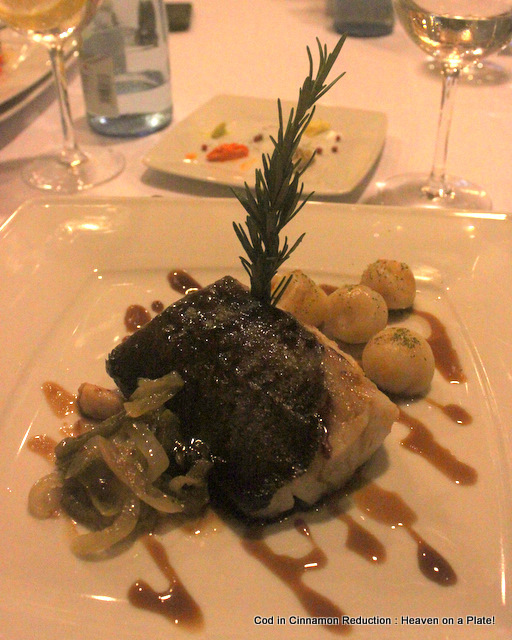 Fine Dining in Tenerife, or Why Should the Tourists Get All the Good Stuff? I often ramble on about the great eateries on my island home, we have a huge variety of international restaurants and bars, and an abundance of excellent bars and cafés serving local food of one kind or another, but I don’t, in these difficult times, often have the opportunity to eat in a restaurant which would come under the “fine dining” heading. How can I put this? I love food! 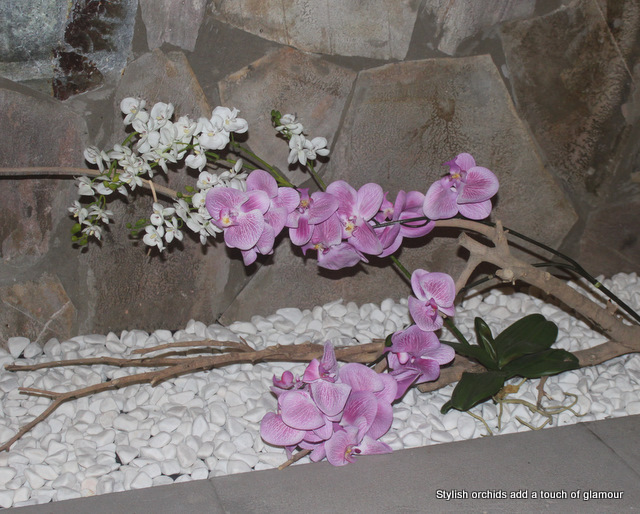 I don’t consider myself to be “a foodie,” but I might come close, and I’ve missed the subtleties and innovations of dining somewhere special, so when gfhoteles offered me dinner in their restaurant La Laja in the Costa Adeje Gran Hotel I jumped at the chance. First, a word of explanation; I’ve stubbornly and intentionally kept this blog fairly low-key because I am very jealous my independence and integrity (long story for another time), and I wasn’t totally sure how accepting invitations fitted into that vision. After spending the past year observing how bloggers for whom I have a lot of respect deal with invitations, links, advertising, etc I think I’ve worked out the way to go. Invitations which are worded like this from gfhotels are okay: “You can write about your opinion, you can Tweet it, Facebook it or whatever, and you can say whatever you want. If there are things you don’t like we will find your feedback useful, and we encourage you to write as you find, or to write nothing at all if you don’t want to.” That sold me, plus there was also the opportunity to meet fellow blogger, Cailin O’Neil, who was here to write about the variety of Tenerife. The Costa Adeje Gran is one of those very posh-looking establishments in the up-market Costa Adeje area, not somewhere with which I am especially familiar. 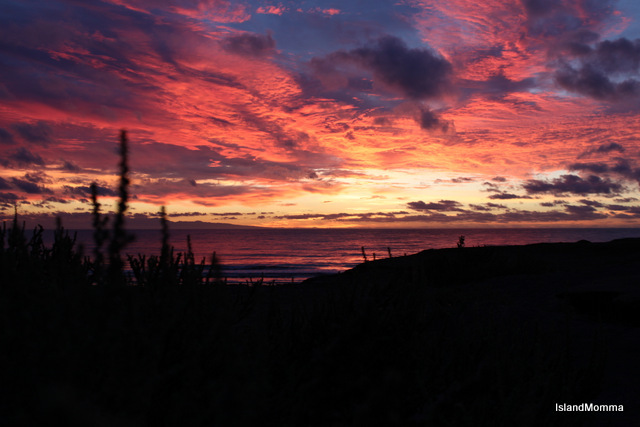 Living here, many of us tend to ignore the tourist resorts, which is almost certainly our loss. We tend to lump everything together as a “concrete jungle,” as do many writers and travel pundits. Generalizing is always a mistake. Sure, there is a tacky side to Tenerife, there is a tacky side to Monte Carlo, and it doesn’t mean that there is nothing of quality to be enjoyed. Certainly Adeje Town Hall has been pulling out the stops to present the municipality as the classier face of the island’s tourism, and it’s obvious that in the Costa Adeje Gran, as in some of the other finer hotels in the neighbourhood, they’ve found willing collaborators. Calin and I arrived at the hotel’s main foyer, but there is a separate entrance to the restaurant. Still, it was interesting to observe the quality of the surroundings and the well-dressed clientele. The lobby is huge and very impressive, and you can actually see the bottom of the swimming pool from beneath – very innovative but unfortunately it was evening, of course, so we didn’t get to see swimmers! We had a warm welcome from Kathrin Jansen, and she gave us a peek at the main hotel dining room before going over to the restaurant, and the aroma made my mouth water. My anticipation mounted – if that was the ordinary dining room, what was La Laja going to be like? What we entered was an elegant restaurant, with a strong Canarian connection, not minimalist, but something along those lines, and warmer and chic in the modern way. This hotel belongs to a local group, gfhoteles, which has three more hotels on the island, and the walls of the restaurant’s reception area are lined with old, sepia photographs of Canarian life, including some of the family who began the venture. 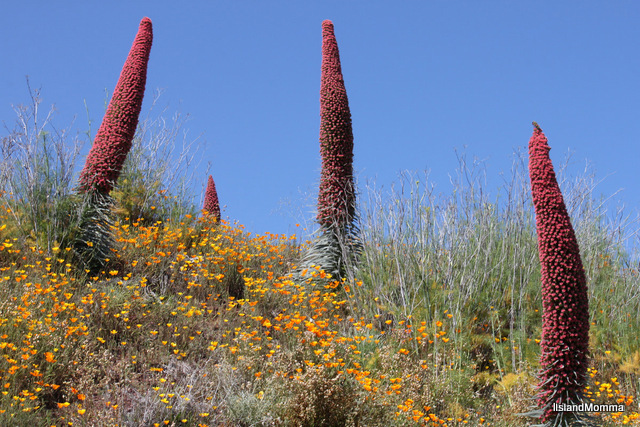 Fascinating for me – I would have gone just to see those! We were shown to a stylishly-set corner table, and greeted by waiters who all had that knack of being both friendly but deferential, which is a sign of good training. I have no complaints about the very friendly service in any of the places I like (I won’t go if service is bad), but it goes without saying that a restaurant of this quality needs something more, and that was the first box ticked. The area is divided into what I can only describe as nooks, with two or three table in each, and a longer section, all fashionably decorated. Chef Pablo Aznar came out to have a word and talk us through the menu, my mouth watering at every syllable! Pablo is from Zaragoza but has worked inTenerifefor eleven years now. Something life has taught me is that if you can get chance to talk with a chef or cook before you eat you get a sense of how good the meal is going to be, because when they talk with love and passion, as Pablo did, then all of that love and passion goes into their cooking. The anticipation mounted. He explained about sourcing the best ingredients, and when he talked about receiving phone calls directly from the fishermen, telling of their latest catch and asking if he was in the market for whatever it was, there was no question in my mind that my choice was going to be fish, and then I spied the word “cinnamon” on a fish course, which clinched it! 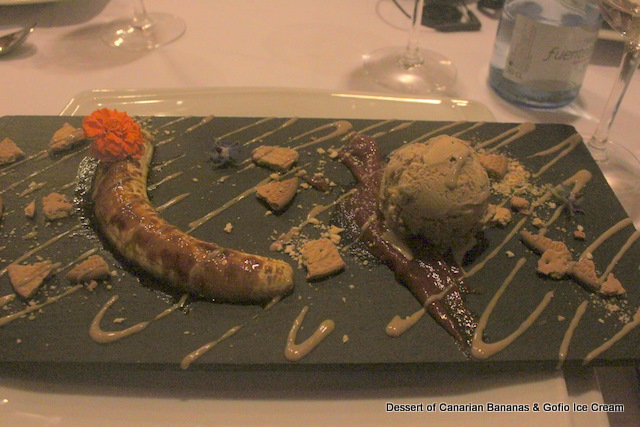 He recommended his lasagne de pulpo for a local touch and a very Canarian desert of bananas and gofio ice cream. Phew, decisions made I could concentrate on the enjoyment! Ordering done, and menus handed back, fresh rolls and flavoured butters arrived. It was late by my dining norms, so I forwent those, but have it on good authority from Cailin that they were delicious. This was a taste of things to come. I had been prompted by curiosity and recommendation (rather than a “Wow, that sounds good” feeling) to try the pulpo lasagne, so it was delightful to find that it easily surpassed expectations, it was tasty, slightly spicy but not too much and very melt-in-the-mouth. I also had a slight reservation about pasta as a starter, but it wasn’t at all heavy and the portion was perfect, satisfying but not too filling! I began to feel as if I was floating! For a split second, I regretted my choice of cod in a cinnamon reduction when my companions’ filet steaks arrived. 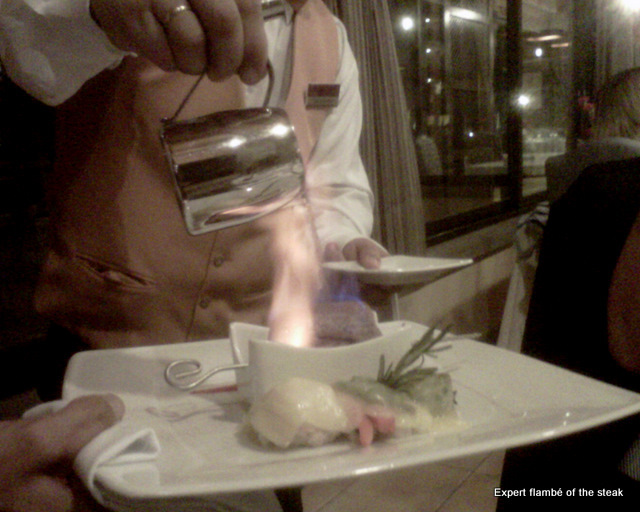 The presentation was charming, the steak in a little dish to collect the jus, and elegantly flambéed at the table. That reaction passed the moment I popped a morsel of the cod into my mouth though. It was heavenly. High expectations this time were quite justified, happily. When my dessert came, I was pleased that I’d passed on bread and on red meat. It was quite yummy – though I did covet Kathrin’s chocolate confection too! My only regret is that I couldn’t try more than a glass of wine to accompany this feast, since I was driving, so I can’t comment on the wine cellar. Conversation over dinner turned towards why more locals don’t sample the dining opportunities local hotels offer. In New York or in London or other European cities it’s quite normal to patronize a restaurant situated in a hotel, but here there is reluctance, and I hold up my hand. For me I think it was to do with hotels being sited in tourist resorts, and the attendant problems, parking for one, but nearby La Laja there is ample parking. I think that there is also probably a kind of snobbery (for want of a better word), in not wanting to mix with tourists. Again that isn’t a problem with La Laja. The hotel’s clientele is clearly not of the beer belly and sunburn brigade, but judging by those I saw, altogether more sophisticated and elegant. On the other hand, there is no need to be put off by the prices, which, at around €9.50 for a main course of high quality is only a little more than some very average restaurants. Do I have any critique? It seems fussy in the face of such scrumptiousness, but I would have like vegetables with my main course. I’m a big fan of veggies, though no way vegetarian. 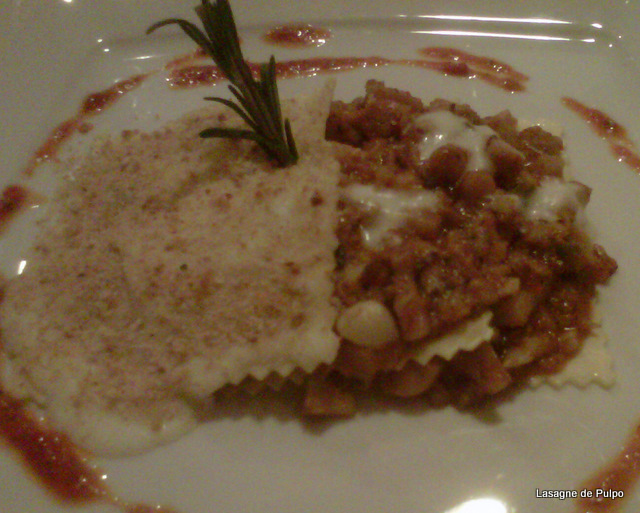 I did note on their New Year menu that they have vegetarian options – more about that later! We, ex-pats, need, I think, to accept that there is a new kind of tourist attracted to the islands now, and why, on earth, should we not avail ourselves of the excellent facilities and opportunities that brings for us too? Thanks to La Laja for a memorable meal, and apologies all round for the quality of the photos, which is well below the standard I aim for. I think I was too aware of not using the flash so as not to annoy other diners, but I just hope the pix of the food are enough to whet your appetites if you live in Tenerife! 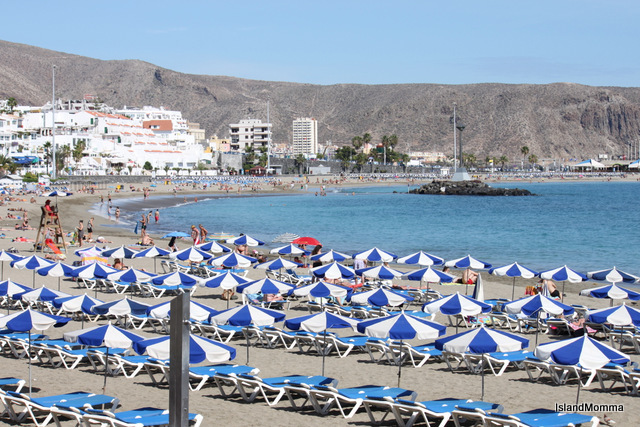 Categories: Canary Islands | Tags: adeje, canary islands, chef pablo aznar, costa adeje, costa adeje gran hotel, eating out in tenerife, fine dining, gfhoteles, la laja restaurant, tenerife | Permalink.